Posted by: Karen E. Davison, Ph.D. When choosing a horse feed, looking at the guaranteed analysis can help you determine if the nutrition content of that feed is appropriate for the age and activity level of your horse. You would think that two products both contain 14% protein, 6% fat, etc. would be pretty much the same feed. However, products with similar guaranteed analyses may be manufactured using different formulation strategies and result in very different feeds. 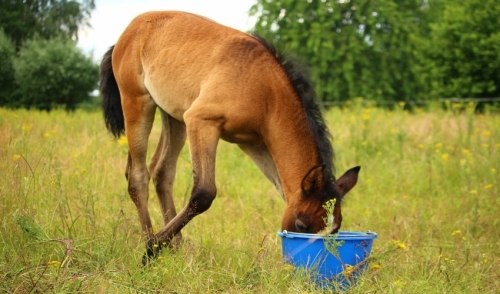 This can affect the nutritional value for your horse. The most common formulation strategies are “least-cost” formulas and “fixed” or “locked” formulas. Both strategies have benefits and drawbacks. For premium horse feeds, Purina uses “constant nutrition” formulation, a more nutritionally accurate formulation. Least-cost formulation allows a manufacturer to adjust the ingredients in the formula based on cost. As long as the formula still meets the guaranteed analysis, the manufacturer can change ingredients used in the formula. In some circumstances, the different ingredients don’t change the effectiveness of the diet, so it makes sense to meet the nutritional needs of the animal in the least expensive way. There would be no benefit to making a more expensive ration to achieve the same results. For instance, if you are feeding cattle and being paid for weight gain and a least-cost formula will not change the rate of gain or feed efficiency of the cattle, but will be less expensive to feed, then that just makes good business sense. However, in some cases, especially when feeding horses, a major change in ingredients can dramatically alter the effectiveness of the diet, even when the nutrient levels don’t change. A good example of this is substituting cottonseed meal for soybean meal in a diet for growing horses. Soybean meal and cottonseed meal may both have similar total protein content and could be interchangeable in a formula to meet the protein guarantee. However, cottonseed meal does not provide the same quality of protein as soybean meal to support growth. So, in this case, the least-cost formula may be less expensive per ton but the loss in animal performance and growth will negate any cost savings. In addition to potential for reduced performance, there is always the potential for reduced palatability and digestive upset in horses when large shifts in ingredients occur in their feed. With fixed or locked formulas, the same ingredients and amounts are used every time the feed is made, regardless of price or nutritional variation of those ingredients. This sounds like the most consistent way to make horse feed; however, there is a significant drawback. All ingredients, even high-quality ingredients, have variation in nutritional content. For instance, all oats will not have the same protein or mineral content. If the formula is completely locked and does not take into account the nutritional content of individual ingredients, the level of nutrition in the finished product will vary. Horses do benefit from consistency in their diets, but they don’t have specific requirements for certain ingredients. Ingredients provide nutrients the horse needs. So, while a fixed formula allows for the same amount of ingredient in every bag, it may not offer the same level of nutrition. For example, a horse feed made of 49% oats, 20% beet pulp, 16% corn, 8% alfalfa and 7% soybean meal would average 14% protein, using the average book values for these ingredients. However, with typical variations in protein content of these ingredients, the end product could range from 12.4% to 21.1% protein. Other nutrient levels will vary as well. While a fixed formula does insure a consistent ingredient profile, it won’t provide the most consistent level of nutrition for the horse. “Constant Nutrition” formulation is a key component of the Purina® FeedGuard® Nutrition System. This strategy provides consistent, reliable nutrition in every bag of premium Purina® horse feed. 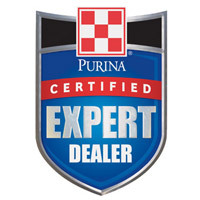 Under the Purina® FeedGuard® Nutrition System, stringent quality standards are set for ingredients purchased only from an approved list of suppliers that meet those strict criteria. Then, when ingredients arrive at a manufacturing facility, they are inspected, sampled and analyzed for nutrient levels. This is more accurate than using published book values or supplier averages for nutrient levels of ingredients. If an ingredient is approved, then the tested nutritional content is entered into the formulation system, which then makes small adjustments in amounts of ingredients to maintain consistent nutrient concentrations in the finished product. There are strict restrictions for how much adjustment is allowed to ensure consistency in formulation. For example, the amount of soybean meal may be adjusted slightly to compensate for lower protein in another ingredient, but cottonseed meal could not be substituted for soybean meal. This formulation strategy ensures that horses receive the most consistent nutrition possible, and that horse owners get exactly what they pay for.